Most people have heard about proteins in the context of food or “protein shakes” but many are unaware that in a biological context, proteins are like molecular robots that perform important tasks for our everyday survival. Every protein has a unique shape and visualising it offers a way to understand how it performs its biological tasks. A faulty protein can lead to many pathological diseases including cancer. 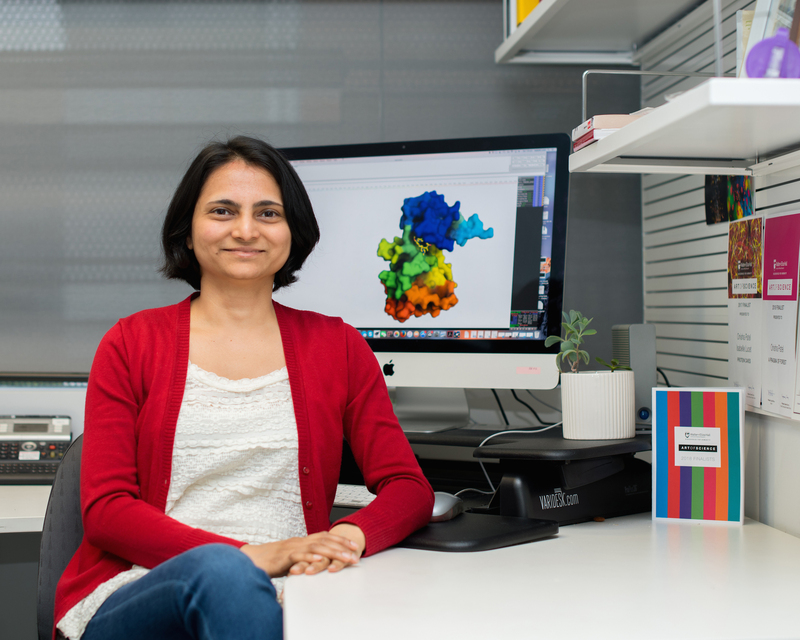 Dr Onisha Patel, a structural biologist at the Walter and Eliza Hall Institute of Medical Research (WEHI), visualises proteins that are important in cancer progression. Onisha uses cutting-edge techniques including the Australian Synchrotron facility to see details inside protein molecules to enable the design of novel therapeutics for cancer treatments. Onisha has held an Australian Research Council Future Fellowship, published in high impact journals, secured competitive funding and holds a patent. Onisha grew up in India and moved to Australia on an international scholarship for postgraduate education and to pursue a career as a scientist. She is a strong supporter of equality and inclusion in STEM and regularly mentors at outreach programs. Additionally, she is deeply passionate about using art as a medium for science communication and education. She has communicated her research to a diverse audience through school visits, art exhibitions, WEHI discovery tours and Open House Melbourne events.